Lompoc Brewing is up to it again. Much like last year, they are going all out to help us celebrate with seven holiday themed beers to help us cope with the forth-coming insanity. This number is down from last year when ten offerings were on the table. Still no disappointment, and solid as always. This year I was joined by good friend and long time supporter of #pdxbeergeeks, Daniel Roy, along with other fine members of the Portland beer culture scene. First up was the Jolly Bock. A wonderful lager with a rich malt character, balanced with a spicy hop bitterness. Dan Roy - This really reminds me a a late night Christmas Eve. The kids are tucked in bed while "Santa" presents are being delivered. Then sitting and relaxing with a nice malty beer. Our next offering was the ever delightful 8 Malty Nights. A chocolate rye beer lightly hopped with English hops. #pdxbeergeeks - I really enjoyed this more then last years batch. Drinking it is like sitting around after a good hearty meal just hanging out with family and friends. Franc'ly Brewdolph was next. Aged for a year in Cabernet barrels, this Belgian style red ale has a malty and creamy body. Dan Roy - I'm flooded with memories of spiced wine at the table late Christmas night, Beer and spiced wine aromas filling the air. 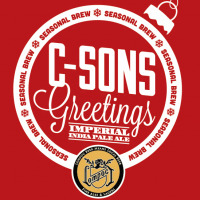 C-Sons Greetings is one I'm always looking forward to each season, so I was glad to see it in the line up. An incredible Imperial IPA. #pdxbeergeeks - This reminds of driving to the farm to harvest our Christmas tree. Then bring it home to decorate it. I can't get enough of this winter seasonal. Ahhh the Old Tavern Rat. An aged barley wine that has a strong bitter, yet well balanced sweetness. Dan Roy - This is like a great Christmas dessert. Even better as it warms up. makes me want some toffee pudding. Last but not least was the Bourbon Barrel Aged Wee Heavy. A collaboration beer with the Ladies of Lagers and Ales (LOLA). After this Wee Heavy was made, it was aged in Heaven Hill Bourbon barrels for nine months. #pdxbeergeeks - I feel like I'm hanging out with my grandfather, sneaking drinks off of his warmed up bourbon. Remembering the warmth it would provide. Also in the line up will be Blitzen, a spiced golden ale that wasn't ready for the preview. Certainly each of these beers will provide you with memories of past holiday times. You can sample each of these tonight at Sidebar from 4-10 for the annual Lompoc Holiday Release Party. Hope to see you there! !